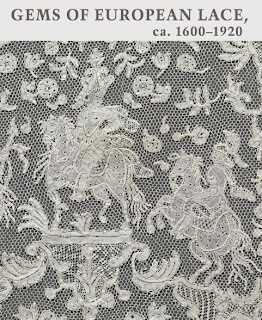 If you find yourself anywhere near the Metropolitan Museum of Art in New York before January 13, 2013, check out their Gems of European Lace exhibit at the Antonio Ratti Textile Centre! Included in the installation are examples of the two major lacemaking techniques: needle lace (built up from a single thread that is worked in a variety of looping, or buttonhole, stitches) and bobbin lace (woven—or braided—together from multiple threads organized on individual bobbins). Beyond the two basic technical categories, lace is also often described with the name of the town or region where a particular style was first made. The exhibition will include outstanding examples of Venetian (needle) lace, Brussels (bobbin) lace, and Devon (bobbin) lace. Of particular interest is a 19th-century handkerchief associated with King Leopold II and Queen Marie-Henriette of Belgium. The queen was a patron of the local lace industry. There is also a lovely filet lace dress which belonged to the early 20th century American socialite Rita de Acosta Lydig an avid collector whose pieces formed the basis for the Costume Institute at the Met. Two Italian examples in the exhibit are from the Nuttall Collection, donated by Magdalena Nuttall in 1908. You can read more about this collection by downloading the Bulletin of the Metropolitan Museum of Art, 1908. A special thank you to Sarah for the info about this event! The 20 finalists are posted on the A Mirror to my Art blog this, as you may recall, is a needlework challenge put on by the Needleprint blog for hand-held mirror needlework, I talked about it here. I know of at least two Italian entries and I am so proud that the Italians took up the challenge to enter this contest as their needlework is so beautiful, I really wanted the English-speaking world to see some of it. Go and vote for your favorite piece, there are 20 entries, each with it's own post. You must leave a comment below the photo to vote. I will wait to talk about the Italian entries until the winners have been chosen so as not to influence the voting in any way. 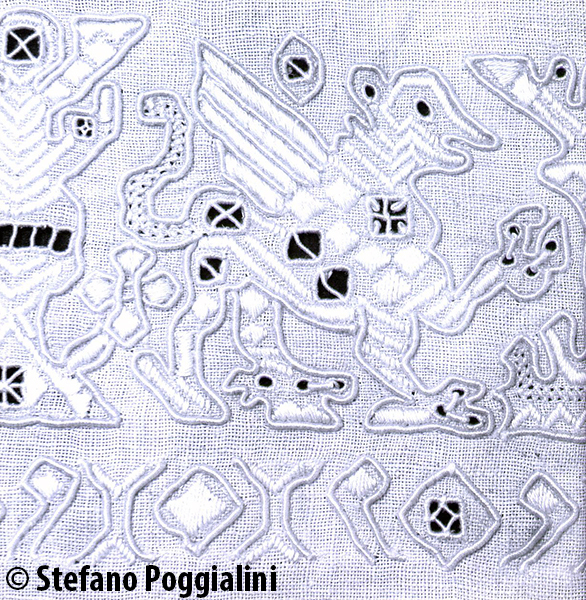 Every year I long to attend (but never have) the Hand Embroidery and Weaving Exhibition at Valtopina in Perugia. I search the internet for reports from attendees and drool over photos posted on blogs and websites. 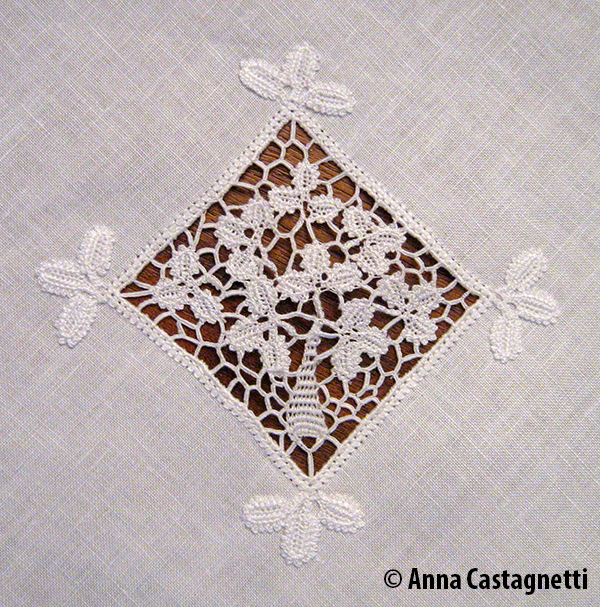 The region of Umbria is rich in embroidery history and there are so many interesting local techniques. One day I really must attend, if for no other reason than to satisfy my longing to do so. Along with the various exhibitions at the show, there is always an open competition and this year's theme was Green Monuments of Umbria - the trees. This year, participants were required to demonstrate the development of their ideas for the pattern on paper and then to produce a tablecloth big enough for six settings (hemmed measurement: 140 cm x 160 cm) along with matching napkins (hemmed measurement: 40 cm x 40 cm) with their embroidery or lace ideas applied. 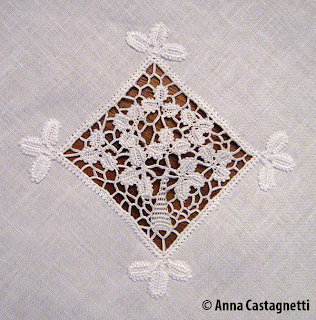 The category of lace was split by two winners using the techniques of Veronese Crochet Lace and a needle lace from the Apuglia region called Punto Maglie. "Donatella made all the Veronese Crochet Lace pieces and I joined them together with needle lace bars covered in buttonhole stitch, after having prepared the holes in the fabric. Each tree is made up of eight pieces (three leaves equal one piece) and the trunk. At the four corners of each insertion there are a further four pieces (the sets of leaves). The insertions are finished around the edges with a cording or overcast stitch surrounded by a row of four sided stitch. Threads used were: DMC Cordonnet Special no. 80 for the buttonhole bars; Anchor Lace no. 20 bobbin lace thread for the Veronese Crochet Lace; Crochet Cotton no. 60 for the rest. I can't tell you how much time it took to make it all, we worked together which doubles the execution time and as we live 50 km away from each other, additional time was required for travel." Congratulations Anna and Donatella! Thank you for sharing the details of this piece with us and for the great photo! In 1911 in the Tuscan municipality of Lamporecchio, an American heiress named Laura Towne Merrick (1842 - 1926) founded a school of lacemaking and "women's work" to provide local women with a means to make extra money. The seat of the school was in a property owned by Ms. Merrick in Piazza Francesco Berni, Lamporecchio. The teacher Clotilde Negroni (1862 - 1931) was brought in from Reggio Emilia to give lessons to students who were to be of at least 12 years old with priority for admission to the school/workshop going to those women who were the most economically in need. These women became workers for the school who produced embroidered items for sale. Taken from Segui la treccia, trovi il ricamo by Federica Mabellini, 2010. A special embroidery style, Lamporecchio Embroidery was developed and works were exported to America where they sold for high prices. This characteristic embroidery style was an overcast stem stitch applied to outlines of mostly animal shapes enriched by satin stitch motifs with openwork and pulled-work accents. Design inspiration came from the paintings and romanesque sculptures found in local churches. 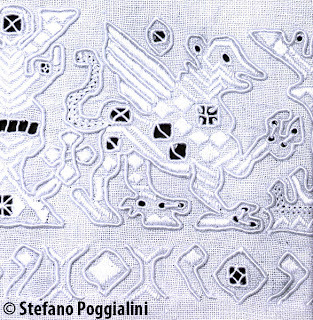 Virginia Torrigiani, lady companion to Laura Merrick continued the interest in the school/workshop after the death of Ms. Merrick, eventually passing the technique of Lamporecchio Embroidery on to her niece Vannina Bonfanti. Today the technique is kept alive by the Club del Ricamo di Casale in Casalguidi. Laura Towne Merrick a Papiano. "La cultura anglo-americana in Toscana alla fine dell’Ottocento" by Michela Cammilli, 2012. Le Dimore di Pistoia e della Valdinievole, Section 1, Chapter 8: Cultura Eclettica 'Fin de Siècle' e Residenze d'Élite. Tre episodi a confronto: Le Ville di Vaioni, Papiano e Cozzile by Gianluca Chelucci; Section 1, Chapter 9: Una Americana in Valdinievole. Laura Towne Merrick e la sua Villa a Papiano by Simone Martini, 2004. Segui la treccia, trovi il ricamo/Follow the plait of straw, you'll find the embroidery by Federica Mabellini, 2010. Storia e Arte del ricamo, Il Punto di Casalguidi by Paolo Peri, 2007.